A top Mont society member and newsletter editor has called for Turkey to be thrown out of the so-called NATO alliance. 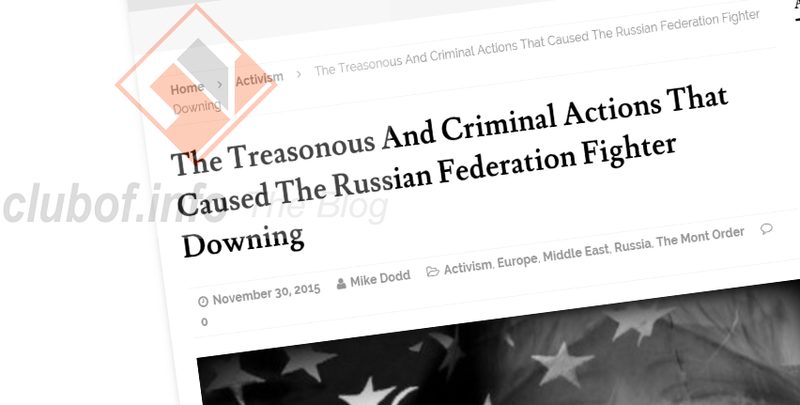 Citing the recent incident when Turkish fighter planes shot down a Russian bomber aircraft while it was striking Turkish-backed terrorist targets, Wave Chronicle editor Mike Dodd described the Turkish government as idiots whose actions are beyond belief. Not only did the Turkish authorities take lethal action against Russian lives to protect terrorists , but Turkish-supported militiamen also broke the Geneva Convention by murdering an unarmed pilot who had parachuted from the burning aircraft before he had even landed. The Wave Chronicle recommended the RT network video, embedded once again by The clubof.info Blog below. "It does not require a single brain cell" to realize that the Russian aircraft should not have been shot down, Dodd stated, noting a video was subsequently shown off featuring the destruction of a Russian rescue helicopter with the loss of one soldier using a US-made TOW missile. In response to this, the editor decried the use of American military hardware in supporting terrorists in Syria and condemned the so-called moderate foreign-backed opposition, stating that "the Free Syrian Army are terrorists". US support for terrorists can be considered treasonous and someone should be on trial for this, according to the Wave Chronicle article. US weapons are being used illegally, by an illegal army, for attacks on Russia and Syria. The Wave Chronicle editor appealed to world leaders for three steps to be taken in response to this crime. First, the US Congress should bring any Americans involved in illegally arming terrorists to trial for treason against the American people. Second, an investigation should be conducted into the illegal act and all involved should be punished with severity, "no matter who or where they are". Third, NATO needs to strike criminal regimes such as the Erdogan government off its membership lists. Since Turkey shot down the Russian aircraft, Russia has intensified its air strikes on terrorists near the Turkish territory and has sent additional fighter planes to destroy Turkish jets if needed.